Shayne Hood and Deedy (Dorothea Jensen to you) are making a TRAILER for our Izzy Elf stories! We Izzies are very excited about this, and can hardly wait to see it. Deedy says she will put it right here in our IzzyElfBlog when it is finished. If she can figure out how to do it. But meanwhile we are all puzzling over the fact that a trailer is NOT something that trails behind something else, but comes BEFORE it. Here is a picture that shows all of us looking worried - we actually look a bit like this right now because we're confused. We're not really worried, you understand, but this picture comes the closest to showing how we feel. 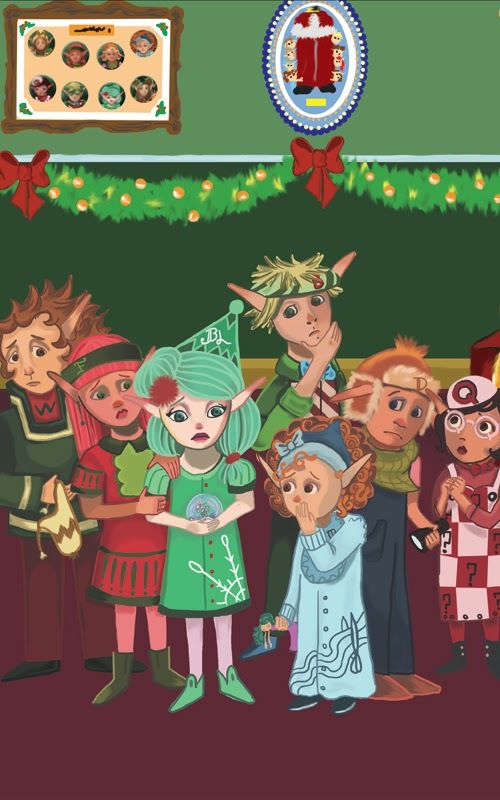 It was created by Shayne Hood for Blizzy's story: Blizzy, the Worrywart Elf. We really were worried when that picture was painted. Not like now. We're just confused. Really. Thanks for reading our blog! !